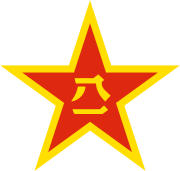 Emblem of the People's Liberation Army (top), PLA flag (bottom). The characters are "8 1", referencing August 1. ↑ IISS 2012, pp. 233–242.